I had always thought that once you grew up you could do anything you wanted—stay up all night or eat ice-cream straight out of the container. Most of what has lived on Earth has left behind no record at all. I refer of course to the soaring wonder of the age known as the Eiffel Tower. Never in history has a structure been more technologically advanced, materially obsolescent, and gloriously pointless all at the same time. Consider the fact that for 3.8 billion years, a period of time older than the Earth's mountains and rivers and oceans, every one of your forebears on both sides has been attractive enough to find a mate, healthy enough to reproduce, and sufficiently blessed by fate and circumstances to live long enough to do so. Not one of your pertinent ancestors was squashed, devoured, drowned, starved, stranded, stuck fast, untimely wounded, or otherwise deflected from its life's quest of delivering a tiny charge of genetic material to the right partner at the right moment in order to perpetuate the only possible sequence of hereditary combinations that could result — eventually, astoundingly, and all too briefly — in you. It is natural human impulse to think of evolution as a long chain of improvements, of a never-ending advance towards largeness and complexity — in a word, towards us. We flatter ourselves. Most of the real diversity in evolution has been small-scale. We large things are just flukes — an interesting side branch. In those days kitchen matches were heavy-duty implements—more like signal flares than the weedy sticks we get today. You could strike them on any hard surface and fling them at least fifteen feet and they wouldn't go out. Indeed, even when being beaten vigorously with two hands, as when lodged on the front of one's sweater, they seemed positively determined not to fail. It's an unnerving thought that we may be the living universe's supreme achievement and its worst nightmare simultaneously. The number of people on whose cooperative efforts your eventual existence depends has risen to approximately 1,000,000,000,000,000,000, which is several thousand times the total number of people who have ever lived. And before long there will be no more milk in bottles delivered to the doorstep or sleepy rural pubs, and the countryside will be mostly shopping centers and theme parks. Forgive me. I don't mean to get upset. But you are taking my world away from me, piece by little piece, and sometimes it just pisses me off. Sorry. One of my duties, this week, is to open the new Ustinov college," he confesses, "and while I'm delighted that Durham should honour its former chancellor this way — and I sincerely hope it continues this tradition for me — I can't help feeling that an American university would only have done so had the chancellor also handed over a substantial amount of dosh. Four times I was honked at for having the temerity to proceed through town without the benefit of metal. I had forgotten just how flat and empty it [middle America] is. Stand on two phone books almost anywhere in Iowa and you get a view. Blackpool's illuminations are nothing if not splendid, and they are not splendid. Despite declining catches, New England fishermen continue to receive state and federal tax incentives that encourage them — in some cases all but compel them — to acquire bigger boats and to harvest the seas more intensively. Today the fishermen of Massachusetts are reduced to fishing the hideous hagfish, for which there is a slight market in the Far East, but even their numbers are now falling. I assume he was descended from apes like all the rest of us, but clearly in his case it had been a fairly gentle slope. 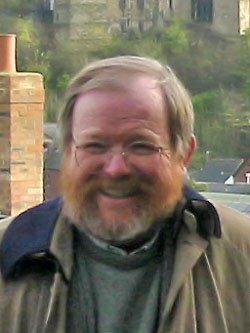 Bio: William McGuire "Bill" Bryson is a best-selling Anglo-American author of humorous books on travel, as well as books on the English language and science.